How does a public television station enter the world of Public Media? AT KETC in St Louis, they have set off on an expedition, just as Lewis and Clark did to explore the unknown world of the west from St Louis 200 years ago. We have chosen one subject to start this journey. As L & C chose one river. We selected The War - a new documentary by Ken Burns that will premiere in the fall on all PBS stations. 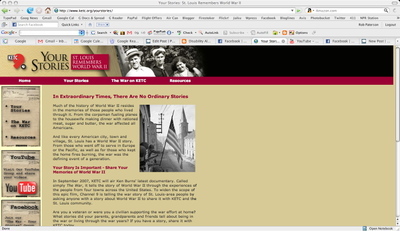 Burns is taking a personal story perspective in this documentary and we hoped that we could add to the experience by setting up some Trusted Space where many in St Louis could share their own stories of the war. 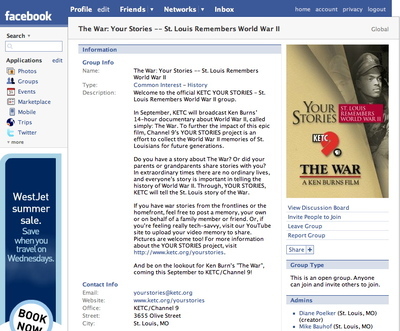 The hope is that the station can connect the young in St Louis with their grandparents and help them act to tell Granny's role as Rosie the Riveter or Grandpa's role in France or the Pacific. 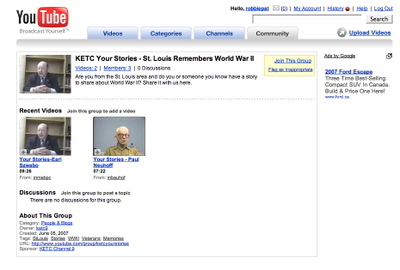 To do that the interns at KETC have helped the "older" staff by setting up two channels. We have started a group yesterday on facebook. Why facebook - the robber Willie Sutton was asked why he robbed banks - his reply "That is where the money is". Why facebook? Because that is where the kids are but also where more and more adults are. There are more than 70,000 folks in St Louis on facebook right now. The growth is impressive. 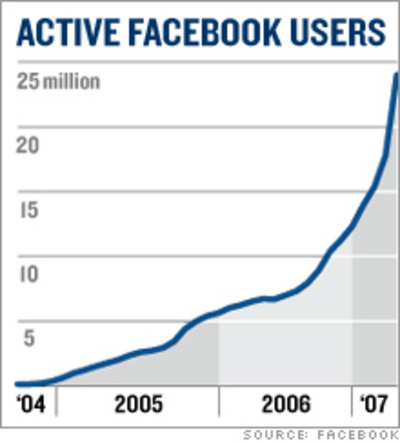 200,000 new members in the facebook system every day! The fastest demographic is those over 25. 85% market share of 4 year universities. 50 million members expected by the end of the year. We wanted to go where the audience will be rather than try and get them to come to us. So what do we know about facebook and all social media? Barely nothing! So we also know that we need help. We are also following Robin Hammam's lead at the BBC in Manchester (by the way there are 10,000 BBC staffers who are also members of facebook) and making links with the social media world of St Louis where we hope to find some expert "Indian Guides" who can help us not be too stupid in territory that we don't understand that well yet. KETC is a TV station - we had to find a new way of using videoa and new standards for video that were not about picture quality. We have also put a toe in the water of Youtube. This is very early for public TV. PBS have a channel as does KQED. But I think that this is the sample so far. Here we hope that people add video of their stories. We intend to share the best on air as well. We are also setting up a "School" at the station. We have a toolkit to help you shape your story and we are also offering editing and recording advice at the station. Talking about schools, we are also working with a class to set up a summer project to tell war stories. During the summer we plan to have face to face events that will also link into our online and on air work. So what's our objective? It is very much like Lewis & Clark's. Social Media, like the west, is an unknown land for those of us brought up in the one to many broadcast world. It has features that we can not even imagine and it has people that have customs that we cannot understand. So Jack Galmiche, the President, like Jefferson, is sending a small expedition staffed by some of his most trusted folks with the help of our own mountain men/women aka our summer interns who are natives of this space already to explore the great rivers of facebook and Youtube. If they come home safe, they will have mapped the key features of the unknown land and they will know most importantly about how to survive and to thrive there. They will come home knowing how to do well in Social Media. They won't have read a book, taken a course, had a consultant tell them what to do - they will have experienced it first hand. They will then be able to apply this hard won knowledge to filling the space. Election 2008 - what would it be like to for the people of St Louis to rediscover real democracy where they had a voice that had power? My St Louis - what would it be like to niche news where every aspect of St Louis was transparently available? What could happen to the arts, to learning, to civic community if KETC was able to learn how to convene the spirit of the city? What would happen to KETC - what would be the future of the station if it could play this role in its community? Once the potential of the west was understood, 50 million people crossed the Atlantic and America's full power was revealed. I believe that once the full power of social media is also understood, American Society will be renewed. Power will shift back to the people. Freedom was the call in the 19th century - it is a powerful call again today. When Lewis and Clark left, it was understood that no one would know what happened to them until their return. You can follow our expedition. You can help us as we stumble along. Please give us a look and offer us your advice.